Besides their common use in atmospheric studies, Doppler radars are promising tools for the active remote sensing of volcanic eruptions but were little applied to this field. We present the observations made with a mid-power UHF Doppler radar (Voldorad) during a 7-h Strombolian eruption at the SE crater of Mount Etna on 11–12 October 1998. Main characteristics of radar echoes are retrieved from analysis of Doppler spectra recorded in the two range gates on either side of the jet axis. From the geometry of the sounding, the contribution of uprising and falling ejecta to each Doppler spectrum can be discriminated. 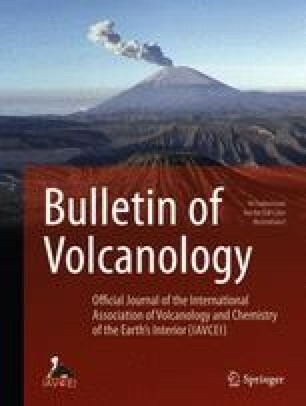 The temporal evolution of total power backscattered by uprising targets is quite similar to the temporal evolution of the volcanic tremor and closely reproduces the overall evolution of the eruption before, during and after its paroxysm. Moreover, during the sharp decrease of eruptive activity following the paroxysm, detailed analysis of video (from camera recording), radar and seismic measurements reveals that radar and video signals start to decrease simultaneously, approximately 2.5 min after the tremor decline. This delay is interpreted as the ascent time through a magma conduit of large gas slugs from a shallow source roughly estimated at about 500 m beneath the SE crater. Detailed analysis of eruptive processes has been also made with Voldorad operating in a high sampling rate mode. Signature of individual outburst is clearly identified on the half part of Doppler spectra corresponding to rising ejecta: temporal variations of the backscattered power exhibit quasi periodic undulations, whereas the maximum velocity measured on each spectrum displays a sharp peak at the onset of each outburst followed by a slow decay with time. Periodicity of power variations (between 3.8 and 5.5 s) is in agreement with the occurrence of explosions visually observed at the SE vent. Maximum vertical velocities of over 160 m s−1 were measured during the paraoxysmal stage and the renewed activity. Finally, by using a simplified model simulating the radar echoes characteristics, we show that when Voldorad is operating in high sampling rate mode, the power and maximum velocity variations are directly related to the difference in size and velocity of particles crossing the antenna beam. We thank S. Vergniolle and an anonymous referee for their thoughtful comments, and A. Woods for handling the paper. This work was supported by the European Community (contract ENV4-CT96–0288), CNRS (INSU-PNRN) and CRV (Coordination de la Recherche Volcanologique). Facilities for radar soundings at Mt. Etna were kindly provided by Istituto Internazionale di Vulcanologia (Catania) and Parco dell’Etna (Nicolosi). F.D. was supported by the French Société de Secours des Amis des Sciences. We gratefully acknowledge helpful contributions from T. Caltabiano, O. Coutant and V. Pinel.